Newsboys Foundation provides grants to community organisations working with young people aged 11 – 21 years in Victoria who are experiencing disadvantage. 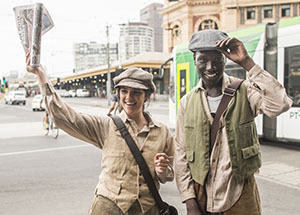 From our beginnings in 1893 as a club for newsboys selling newspapers on the streets of Melbourne to our current role as a Foundation – Newsboys has remained true to our mission of supporting young people in Victoria who need assistance to realise their full potential. Since 1974 Newsboys Foundation has allocated more than $16 million to fulfil this simple but vital mission. Each year, Newsboys Foundation provides grants to approximately 35 community organisations that are working with young Victorians experiencing disadvantage. Our grants reach every corner of Victoria, supporting programs that are targeted at regional, metro and statewide youth. In particular, we focus on supporting young people from low socio-economic circumstances, young people in rural and regional Victoria, young Indigenous people, young refugees and asylum seekers and young people with disabilities. Our grants cover a wide range of projects and programs including academic pursuits, arts and cultural activities, sport and outdoor education and vocational/life skills. By supporting young Victorians in each of these areas, we aim to reconnect young people in a positive way into their community, re-engage them in education and re-ignite their passion for learning.